Intuit (INTU) stock is soaring on heavy trading volume on Friday, after the software company's fiscal 2016 first quarter earnings results beat analysts' expectations. NEW YORK (TheStreet) -- Intuit (INTU - Get Report) stock is rising 4.74% to $102.04 on heavy trading volume on Friday, after the company's fiscal 2016 first quarter earnings results beat analysts' expectations. After the market close on Thursday, the Mountain View, CA-based financial software company, known for its TurboTax products, reported earnings of 9 cents per share. Revenue increased 17% year over year to $713 million. Analysts surveyed by Zacks Investment Research were expecting a loss of 3 cents per share on revenue of $669.6 million. The company raised its fiscal 2016 earnings guidance to $3.45 per share to $3.50 per share, versus its previous guidance of $3.40 per share to $3.45 per share. "We started the fiscal year the same way we ended the last, with strong momentum across our businesses as our intense focus on our global cloud strategy takes shape," CEO Brad Smith said in a statement. So far today, 3.44 million shares of Intuit have traded, versus its 30-day average of 1.58 million shares. 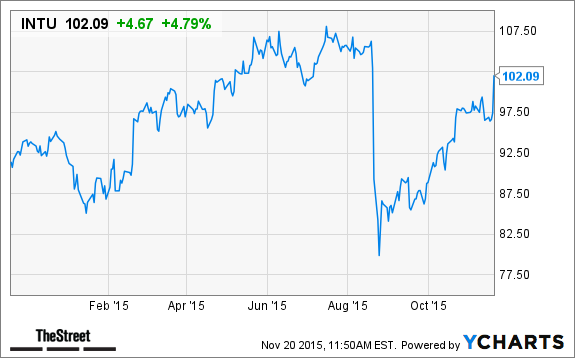 We rate INTUIT INC (INTU) a HOLD. The primary factors that have impacted our rating are mixed - some indicating strength, some showing weaknesses, with little evidence to justify the expectation of either a positive or negative performance for this stock relative to most other stocks. The company's strengths can be seen in multiple areas, such as its increase in net income, largely solid financial position with reasonable debt levels by most measures and expanding profit margins. However, as a counter to these strengths, we also find weaknesses including premium valuation, weak operating cash flow and feeble growth in the company's earnings per share. Any reference to TheStreet Ratings and its underlying recommendation does not reflect the opinion of Jim Cramer, TheStreet or any of its contributors.